I concur! I suspect that the talk about “email dying” has more to do with the fact that nonprofits have not, for the most part, mastered it! After all, what better method does the small, grassroots organization have of regularly cultivating donor relationships than via email? 1. Locate an email service provider. Nancy Schwartz of Getting Attention recently posted this terrific article. Keep in mind: cost is not your only factor. Ease of use, deliverability rates and customer service play major roles in the selection of an ESP. I recommend iContact for all three qualities. 2. Create an e-news sign-up on your homepage. It should be prominent and located “above the fold” – meaning that viewers should not have to scroll to locate it. 3. Offer a compelling reason to sign up. I’m sorry. “Subscribe to our e-news” is not a compelling reason. 4. If your organization has access to a tech wizard, consider an attention-getting floating popup box like that featured on my website. (I know, I know. “Nonprofits don’t do that! !” Remember, now is not the time to emulate your unsuccessful peers – now is the time for boldness.) Check out John Haydon’s terrific how to article. 5. Your sign-up box should appear on every page of your site. 6. Consider how much information you want to collect when designing your sign-up box. Too much information (address, DOB, even asking for a phone numbere) might scare away a potential subscriber. An email address and first name is enough to begin the cultivation process. 7. Thank people for subscribing. Your sign-in box should redirect to a thank you page AND your new subscribers should receive a welcome email. If you cannot figure out how to do this, contact the customer service department of your ESP (ohhhh, that’s why you made the decision not to go with a free provider!). Better yet? Create a three to five-part autoresponder series of welcoming emails, spaced over a period of weeks, introducing your new subscribers to your fabulous organization! 9. Establish a regular schedule of communicating with subscribers – and stick to it. I recommend twice a month – or monthly at the very minimum. 10. Study headlines. Headlines? Yes, headlines. You want your email opened don’t you? Your email’s subject header can be more important than your copy. Words That Sell is a great little reference source you’ll want handy on your bookshelf. 12. Think integration and cultivation. 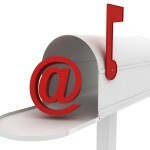 Every direct mail piece, every social media tool (Twitter, Facebook, etc.) should link to your home page featuring your opt-in. What fantastic advice! You offer great resources that would apply both to grassroots nonprofits and to people running their own businesses. I’d love to see more small nonprofits doing a better job communicating with constituents, and it seems so true that consistent email updates are the best way to build solid relationships. I hope LOTS of nonprofits follow your directions! These tips are great. Thanks so much. I’m new to fundraising and will definitely be checking back into your blog. Oh, and I’m going to feature this post in this week’s NTEN member round up! Great marketing advice for any business so you know it is going to work for nonprofits too. I just wanted to reiterate your advice to integrate. Nonprofits really need to tie together points #2 and #9. An organization needs to be focused on talking with contacts and sharing info they can\’t get elsewhere. You are so right- I don\’t spend my time just reading newsletters. I need to know that I am going to get something that speaks to me in each edition. Good list, Pamela. I especially believe #7 can be accomplished with a personal touch. I send personal thank yous to my new subscribers, one at a time – in addition to the automated one from the email supplier. Well put! All emails services are not created equal. If you more than 5000 you’ll. Need a cost effective solution. We recently used Chic CEO, had a few glitches but worked out in the end. Remember to engage in emails – polls, et al. Finally – you’ll need an opt out solution for your clients.